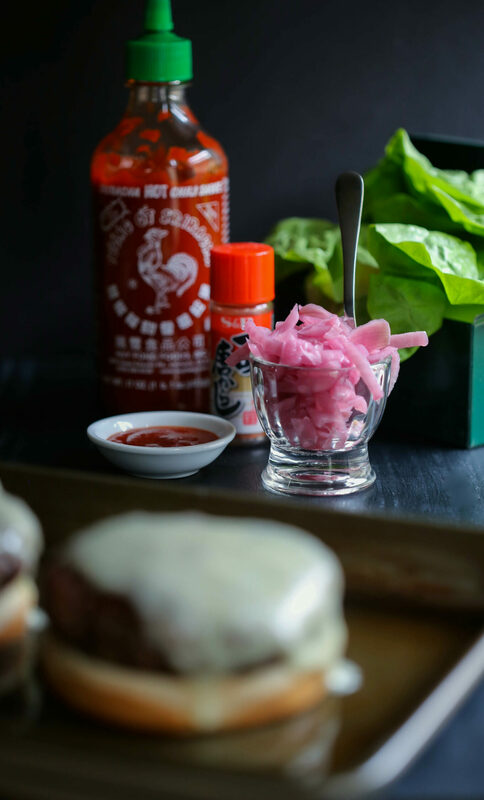 Spice up your weeknight burger menu with this juicy Korean BBQ Burger with Pickled Onions! Full of flavor and easy to make! Hump days call for a juicy burger. Something hearty, but not to over the top because the weekend is going to be here in like five minutes and my potential gluttonous dinner plans need not be out shined. And speaking of the weekend, what are your Valentine’s Day plans? Anything? Also, word on the street is that President’s Day is the day after Valentine’s Day. It’s like a holiday two-fer, friends. Mr. B and I still have zero plans as of right this second to celebrate either holiday. We are way chillaxed when it comes to hoopla around Valentine’s Day. If Mr. B sent me a dozen roses to work, I would probably freak out and automatically assume our house burned down or something ridiculous. Can you say drama queen? Anyway, if you have some fun ideas on what we should do to celebrate national love day and ol’ Washington’s birthday, send me your suggestions! 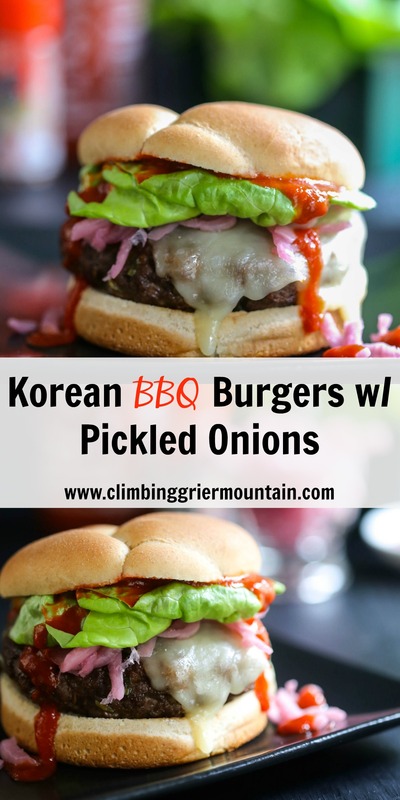 Until then, you will find me grilling up this Korean Barbecue Burger with Pickled Onions. Truth: I have never been to Korea. Although visiting South Korea is on my bucket list because I hear North Korea is super risky with a certain homeboy in charge. However, after googling certain flavors, I feel this burger could almost pass for local Korean cuisine. Ginger, sesame oil, brown sugar, soy sauce, and if you want to bring up the heat level, I would add some chili paste to this burger mix. But whatever you do, don’t forget the pickled onions! 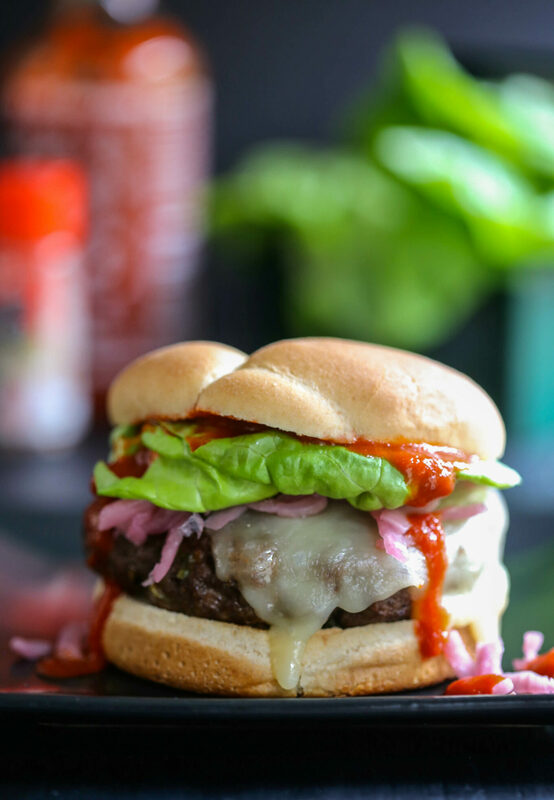 They are so easy to make and give this burger an extra two-snaps around the world. Or, is it two humps around the world? 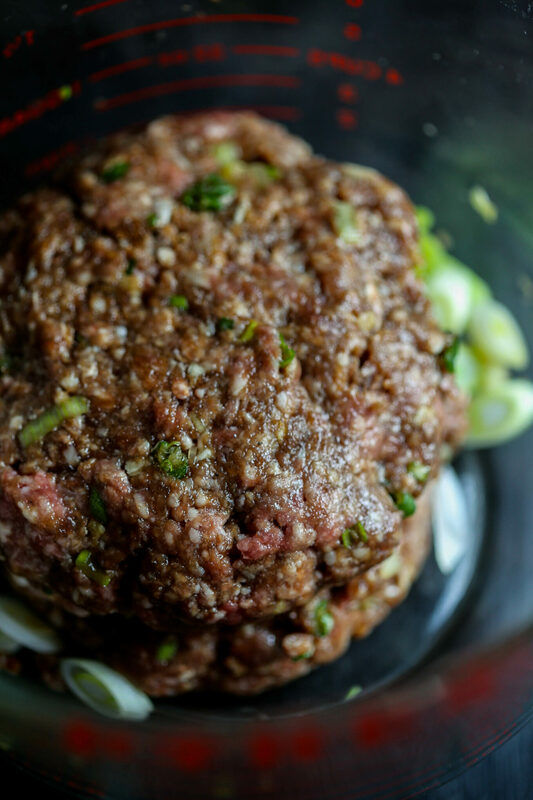 In a large bowl combine ground beef, brown sugar, ginger, soy sauce, sesame oil, green onions, salt and pepper. Form into four hamburger patties. Preheat a skillet to medium-high heat, add the butter and let it melt. Place the hamburger patties into the skillet and grill for about five minutes on side one, flip, and continue to cook for additional three minutes or until medium-well. Remove hamburger patties from skillet and place on a plate to rest before serving. To serve, place a patty on the bottom of a burger bun. 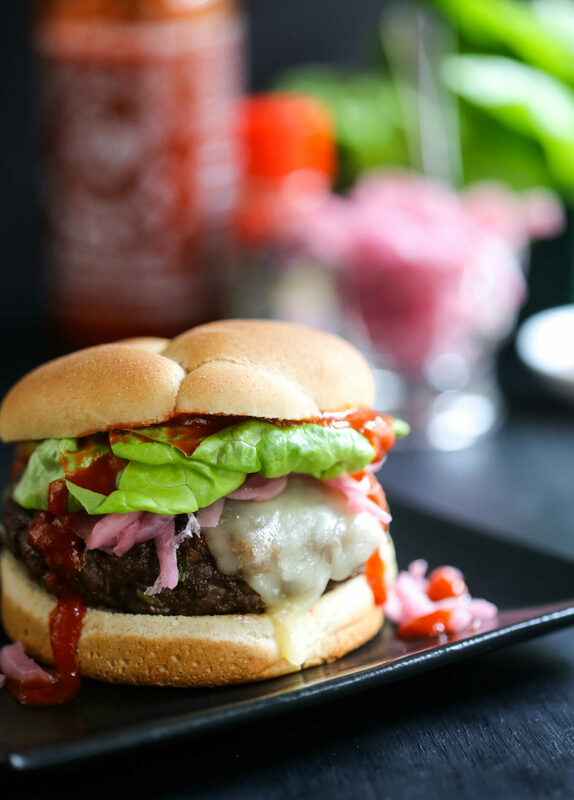 Top the patty with lettuce, cheese, ketchup, Sriracha, and pickled onions. Place top hamburger on top and serve. In a small saucepan, bring water to a boil and add red onion slices. Boil for about a 1 minute. Drain red onions in a colander and then place red onions in a cold ice bath to keep it from cooking for about a 1 minute. In the same saucepan, add apple cider vinegar, salt and red onions. Stir, cover the onions with just enough cold water. Bring to boil for another minute. Remove from heat and carefully ladle red onions into a glass jar. Chill until onions become desired pickle taste!